The most compelling graph I’ve ever seen was put together by Andrew Coulson, one of my colleagues at the Cato Institute. It shows that there’s been a huge increase in the size and cost of the government education bureaucracy in recent decades, but that student performance has been stagnant. But if I had to pick a graph that belongs in second place, it would be this relationship between investment and labor compensation. The clear message is that workers earn more when there is more capital, which should be a common-sense observation. After all, workers with lots of machines, technology, and equipment obviously will be more productive (i.e., produce more per hour worked) than workers who don’t have access to capital. And in the long run, worker compensation is tied to productivity. This is why the President’s class-warfare proposals to increase capital gains tax rates, along with other proposals to increase the tax burden on saving and investment, are so pernicious. The White House claims that the “rich” will bear the burden of the new taxes on capital, but the net effect will be to discourage capital investment, which means workers will be less productive and earn less income. Diana Furchtgott-Roth of Economics 21 has some very compelling analysis on the issue. President Obama will propose raising top tax rates on capital gains and dividends to 28 percent, up from the current rate of 24 percent. Prior to 2013, the rate was 15 percent. Mr. Obama seeks to practically double capital gains and dividend taxes during the course of his presidency, a step that would have negative effects on investment and economic growth. …the middle class would be harmed by higher capital gains tax rates, because capital would be more likely to go offshore. …[a] higher rate would have negative effects on the economy by reducing U.S. investment or driving it overseas. If firms pay more in capital gains taxes in America, they would make fewer investments — especially in the businesses or projects that most need capital — and they would hire fewer workers, many of them middle-class. Higher capital gains taxes would reduce economic activity, especially financing for private companies, innovators, and small firms getting off the ground. Taxes on U.S. investment would be higher compared with taxes abroad, so some investment capital is likely to move offshore. At this point, I want to emphasize that the point about higher taxes in America and foregone competitiveness isn’t just boilerplate. According to Ernst and Young, as well as the Organization for Economic Cooperation and Development, the United States has one of the highest tax rates on capital gains in the entire developed world. The only compensating factor is that at least these destructive tax rates aren’t imposed on foreign investors. Yes, it’s irritating that our tax code treats U.S. citizens far worse than foreigners, but at least we benefit from all the overseas capital being invested in the American economy. By the way, Diana also points out that higher capital gains tax rates may actually lose revenue for the simple reason that investors can decide to hold assets rather than sell them. Here’s some of what she wrote, accompanied by a chart from the Tax Foundation. …higher capital gains tax rates rarely result in more revenue, because capital gains realizations can be timed. When rates go up, people hold on to their assets rather than selling them, expecting that rates will go down at some point. …Capital gains tax revenues rose after 1997, when the rate was reduced from 28 percent to 20 percent, and again after 2003, when rates were reduced further to 15 percent… The decline in rates resulted in higher tax receipts from owners of capitals, as they sold assets, giving funds to Uncle Sam. Yes, the Laffer Curve is alive and well. Not that Obama cares. If you pay close attention at the 4:20 mark of this video, you’ll see that he wants higher capital gains tax rates for reasons of spite. But I don’t care about the revenue implications. I care about good tax policy. And in an ideal tax system, there wouldn’t be any tax on capital gains. It’s a form of double taxation with pernicious effects, as the Wall Street Journal explained back in 2012. …the tax on the sale of a stock or a business is a double tax on the income of that business. When you buy a stock, its valuation is the discounted present value of the earnings. …If someone buys a car or a yacht or a vacation, they don’t pay extra federal income tax. But if they save those dollars and invest them in the family business or in stock, wham, they are smacked with another round of tax. Many economists believe that the economically optimal tax on capital gains is zero. Mr. Obama’s first chief economic adviser, Larry Summers, wrote in the American Economic Review in 1981 that the elimination of capital income taxation “would have very substantial economic effects” and “might raise steady-state output by as much as 18 percent, and consumption by 16 percent.” …keeping taxes low on investment is critical to economic growth, rising wages and job creation. A study by Nobel laureate Robert Lucas estimates that if the U.S. eliminated its capital gains and dividend taxes (which Mr. Obama also wants to increase), the capital stock of American plant and equipment would be twice as large. Over time this would grow the economy by trillions of dollars. John Goodman also has a very cogent explanation of the issue. 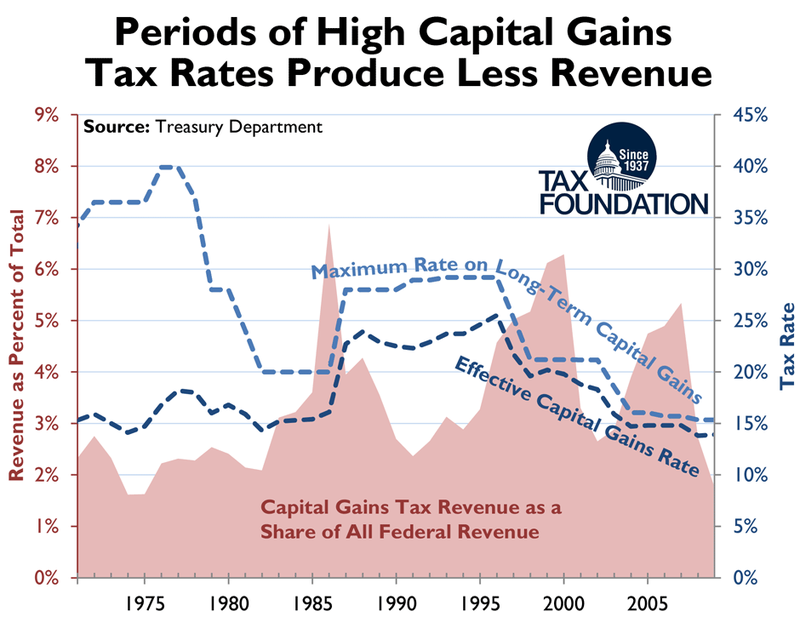 …why tax capital gains at all? …The companies will realize their actual income and they will pay taxes on it. If the firms return some of this income to investors (stockholders), the investors will pay a tax on their dividend income. If the firms pay interest to bondholders, they will be able to deduct the interest payments from their corporate taxable income, but the bondholders will pay taxes on their interest income. …Eventually all the income that is actually earned will be taxed when it is realized and those taxes will be paid by the people who actually earned the income. ……why not avoid all these problems by reforming the entire tax system along the lines of a flat tax? The idea behind a flat tax can be summarized in one sentence: In an ideal system, (a) all income is taxed, (b) only once, (c) when (and only when) it is realized, (d) at one low rate. And if you want to augment all this theory with some evidence, check out the details of this comprehensive study published by Canada’s Fraser Institute. For more information, here’s the video I narrated for the Center for Freedom and Prosperity, which explains why the capital gains tax should be abolished. P.S. These posters were designed by folks fighting higher capital gains taxes in the United Kingdom, but they apply equally well in the United States. And since we’re referencing our cousins on the other side of the Atlantic, you’ll be interested to know that Labor Party voters share Obama’s belief in jacking up tax rates even if the economic damage is so severe that the government doesn’t collect any revenue. P.P.S. Don’t forget that the capital gains tax isn’t indexed for inflation, so the actual tax rate almost always is higher than the statutory rate. Indeed, for folks that have held assets for a long time, the effective tax rate can be more than 100 percent. Mon Dieu! President Obama says he wants higher tax rates for fairness, even if the government doesn’t collect any revenue. Rich leftists say they want higher taxes because they can afford to pay, but then refuse when offered a chance to cough up some cash. Elizabeth Warren supports higher taxes because government made it possible for rich people to succeed. Warren Buffett wants a big tax hike because…well, because he’s bad at math. Some leftists support higher taxes because they assume that rich people obtained money dishonestly. The New York Times wants higher taxes on the rich in order to enable higher taxes on the middle class. I suppose leftists deserve credit for being adaptable. Just about anything is an excuse for soak-the-rich tax hikes. The sun is shining, raise taxes! The sky is cloudy, increase tax rates! Or, in this case, Obama is giving a speech, so we know higher tax rates are on the agenda. P.P.P.P.S. You deserve a reward if you read this far. You can enjoy some amusing cartoons on class-warfare tax policy by clicking here, here,here, here, here, here, and here. Well, duh! is this not perfectly obvioous? Redistribution is only a very temporary relief to the middle class of a declining nation, a nation whose growth trendline is structurally below average world growth. 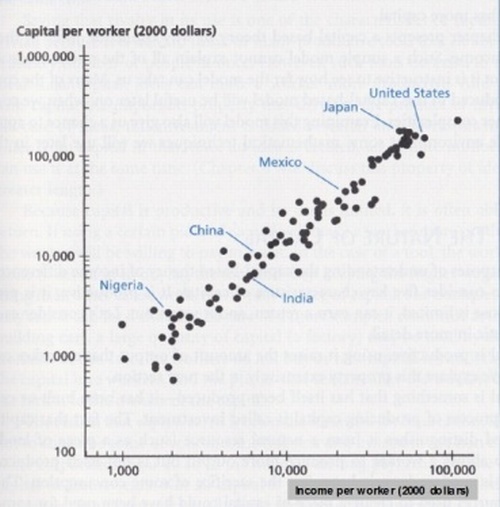 But the resulting flatter effort-reward curves of redistribution will decrease motivation, productivity and competitiveness at all levels of American society, and thus accelerate the fundamental issue of decline: a nation that can no longer match, and even less exceed, average world growth. That is the simple arithmetic of decline. This is the decline the American people are now living through. But it is a decline that the American people brought upon themselves as they succumbed to the irresistible temporary comfort of flatter effort-reward curves, and the statism that enables them. They are now sealing their fate of decline by responding to the effects of decline, supporting even flatter effort-reward curves, until the US fully joins the club of once prosperous but now precipitously declining European demotivated welfare states. The vicious cycle has closed and wiser people with more international horizons should be preparing their way towards alternatives in better and more vibrant environments. In this environment, The People, will seek, find, ferret out the Obamas, and elect them into office. The main fault is not with Obama but with three hundred million once enviable voters, who have exchanged their social capital for Euros. The American people will burn the furniture to keep warm another couple of winters. The vicious cycle to structurally lower growth and hence European decline is here. Exactly so. Just like minimum wage hikes that erode purchasing power for all, “free” healthcare coverage that reduces costs, doesn’t increase taxes “one dime” while providing a 2500 per family influx due to reduced cost. Let’s start with Green Energy jobs that never were, how about higher electricity costs due to over regulation. Wonder why electric cars seen cheaper to operate? Put aside maintenance for now and battery disposal that will surely go through the roof. Let’s focus on use taxes, the kind that averages .50 for every gallon of gas. Does anyone really believe those taxes will go away? No, in fact they will double. All damn lies by the Left and their hero Obama. BTW did you here Yemen’s Presidential palace fell to that fictitious thing Al Queda? Guess they weren’t really defeated but merely banished from American media. Guess what lies right next door, Oil. The worlds oil.